How to get the right waterbed mattress for you? Are you getting the WAVE REDUCING and SUPPORT you need? DO you agree, for wave reducing baffles to be EFFECTIVE they need to float? Next See this image ……… as a example ……….. The vast majority of clients order by layer …………. There is no industry standard to what grammage the layer is ……. So what are you buying ? ……. DON’T FORGET BOTH ARE FOUR LAYERS. WHEN ORDERING YOU NEED TO QUALIFY ………..
Like if you have a 3A then 3B will be close 900 and 1000 respectively SIMPLE …. eehh.. There are also “H” fibres. These are a combination of ‘A’ s and ‘B’s mad ????? Well here is more .. If in doubt visit our showroom in Chermside Waterbed Shop in Brisbane. More and more are coming BACK to waterbeds. Now I wish I had a dollar for everyone who said that to me ……. Do you see where 2 x 300 come in .. Yes … Price .. and a waste of time and effort. Need a scientific instrument to measure that one as far as wave reducing is concerned …. So I am going to base each Layer / Level at 500 grams. Something that has reality. So if you have a AQUA Serene 4 layer = 1200 or 4A = 1200 then if you like it a little firmer then or 1500 is the option. So if you have a AQUA 4 layer that is 500 = 2000 or 4B = 2000 then or 2000 is the option. and so forth. A little firmer than a ‘4H’ then the 2000 would be the option ….. and so forth. We go on the collective total as per above ……………… Setting the bench mark to a common denominator that has good and real effect in wave reducing. It is NOT necessarily how many. You need to also qualify the weight of the layer …..
this is what you can get !!!!! WATERBED WAVE REDUCING BAFFLES NEED TO FLOAT to be effective. There are some who are still out there who will dodge questions. Yes they have the maximum baffles. Don’t forget “THEY”, the company who sells them. Our competitors baffles vs the Premium Dreamlover Ovation 555 baffles. When you ask a competitor whether they make their own mattresses, they might say something like “yes, we supply our own brand of mattress”. That does not mean that they make their bladders, just that they are a cheap fully imported bladder with their label. This maybe a legitimate sales tactic, but we find it very disingenuous and a little deceptive. 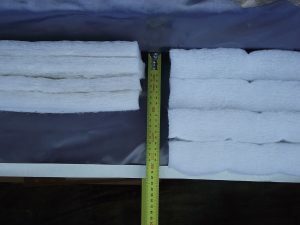 So we have 5 x 450 gram baffles (their rating) on the bottom of the waterbed bladder the total of 2250 collective weight. Between and 4 x 500 2000 EXTRA FIRM and 5 x 500 HARD. BUT …. So how do they compare to the floating Australian products. There maybe be one fluke but to date as at October 6 2018 we have NOT seen any that float. They are sold on the placebo effect. Customer think they are getting but they are not. They claim PERCENTAGE of wave reduction, probably out of THEIR HAT. At best in a Timber queen for example the baffle bulk on the bottom admittedly does TOWER up. So far a infield rating on a 5 x 450 = 2250 would be a 1000 rating in the Aussie made wave reducing bladders. If you are happy with the waterbed bladder you have now, keep this under you hat for perhaps future information. If the baffle wave reducing mat is intact ie: not tangled up then when putting in you conditioner, look at the base near the valve as a indicator. Baffles are the fibres inside the mattress and are there to reduce movement. Basically, the more baffles, the less movement. The baffles inside a bladder are meant to float and when you lie down on a waterbed, the weight of your body comes into contact with the baffles inside. If the baffles do not float, then you are not getting the optimal output and comfort from your bed. In order to effective, baffles need to float. If you open the valve on your current mattress, then the very first thing you should see is the baffles. If the waterbed bladder has a wave reducing rating like 3 layer 4 layer 5 layer etc. IF YOU DON’T SEE THEM like this near the base of the valve and you are not comfortable then there are issues. Also if you have recently purchased one and it does not perform then this section maybe of interest as well. They have probably gone DEEP SIX. Baffle on the bottom. Hellooooo…. Baffle down there …….. I can just see you ………. One of the main differences between Waterbed World and some other competitors, is that we make our wave reducing mattresses ourselves in our Jimboomba factory and are only available through Waterbed World. These bladders are manufactured in Queensland, Australia. Our heavy 1000gsm baffle layers are the foundation layers. We increment these with a 500gsm layers to give the various levels of medium, firm, extra-firm and hard. This makes baffles a lot more reliable, durable and resistant to tangling and degrading. When purchasing or replacing a waterbed bladder, changes may have occurred. We find this in 70% of clients. The baffles have sunk to the bottom and are not effective. 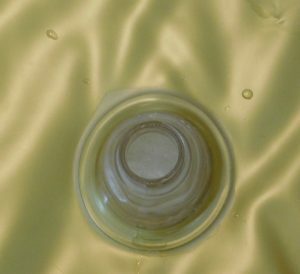 The baffle raft needs to float to be effective in offering support and wave reduction. When purchasing a mattress, qualify what the 5yr Warranty actually covers and read the fine print. If the baffles themselves do not have a guarantee, then what will happen if they sink? We see this nearly everyday, and it just shouldn’t be the case. Compare the difference !! 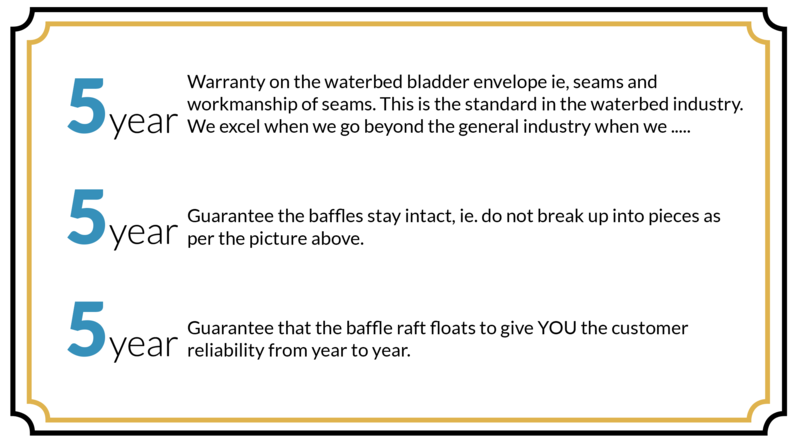 When buying a waterbed bladder, we believe that YOU the customer need what you are after, to be long lasting and have consistent support throughout the life of the mattress. As we have the capacity to do so, we can back up our ideals. DON’T LET THEM DODGE THE FOLLOWING QUESTIONS …..
“Are their mattresses fully made overseas? To date, we have observed that 100% of fully imported wave reducing bladders from China have baffles that have sunk to the bottom after a short amount of time because they have insufficient or no flotation. And frankly, that is just not good enough !! Do you think you are going to have the same comfort when this happens a few months or years down the track? 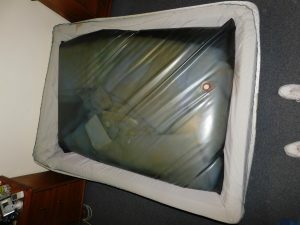 Both of these beds were sold by our competitors, and neither of them had the baffle flotation as part of the warranty. Do you think getting a new replacement bladder will have the same feel after the above images? The feel can be VERY, VERY different. The Dreamlover Diamond Ovation 555. Our own premium mattress line is called the ‘Diamond Ovation 555’. The Diamond Ovation 555 comes with a premium 5 year warranty on corners, seams and baffles. Ask for the 555 by name. This is a premium product that stands head and shoulders above the rest. Nothing to date comes even close !!!!! We guarantee that our baffles will float after 5 years. We can make cheaper mattresses upon order if required, but we have found that over the years our customers are happy to pay a little bit more for a quality mattress with a genuine guarantee in writing and full piece of mind. Our competitors may say they make their own bladders, but most do not. They mostly import directly from China and put their own label on the bladders, but they do not make them. Most other manufacturers baffles start with a foundation layer of 300gsm – less than a third of ours. It is because of this that we can offer a warranty on the baffles. We know that ours will stand the test of time. We source the best baffle fibres locally to start with, then insert them into our bladders to our customers specifications. The wave reducing bladders on this website are not fully imported, but are a genuine product of Dreamlover Waterbed World. Alongside with the foam bath, the mattress/bladder is arguably the most important decision you will make when buying a new waterbed. It is the mattress which contains the baffle fibres which will make your bed softer or firmer to meet your individual needs. These baffle fibres can be found in many different weights across the industry as there is no standardised definition on how thick a layer needs to be. At Waterbed World, we want to make selecting your ideal mattress as easy as can be. The best way to know exactly what your perfect waterbed is, is to come into our showroom and feel the differences between them all. Because we make our own bladders and baffles, and because we are so proud of the quality that goes into each mattress, we are the only manufacturer to offer a full 5 year warranty on our Dreamaster Ovation Diamond 555 mattresses. And yes, that includes the baffles inside. Phone for good old fashion service where people actually speak to you. There are few types of mattress bladders that we offer at Waterbed World. We stock mattresses for softsider waterbeds, Timber Framed waterbeds, and we even do specialised beds like round and octagonal beds upon request. All our mattresses feature full bladder control with your choice of baffling inside. Because we make our own mattresses, we can also custom make a mattress to your exact needs. If you find you want something in between a medium and firm mattress, we can do it. And with a 5 year warranty too. We also specialise in ‘duet’ and ‘twin’ systems. These beds are very popular sellers for couples as each person can set up their half of the bed to the exact way they like it. The big benefit of the duet series is that movement from tossing and turning and getting in and out of bed is minimised to nearly zero. And another extra benefit is that each side of the bed is individually temperature controlled so one person can set their ideal temperature without affecting the other. The single bladder softsider waterbed has become ubiquitous over the years, and is still a very popular mattress. This mattress is perfect for singles or couples, although there is noticeable movement when tossing and turning. These mattresses come in all the different comfort levels to ensure a perfect nights sleep. Single bladders can be used in all waterbeds except for the Duet systems. One of our most popular sellers. Our duet/twin system is the perfect choice for couples who love waterbeds but have different needs from their mattresses. If one couple loves the bed soft and the other needs it firm, then this is the system for you. Another benefit to the twin system is each side is individually temperature controlled. One person may prefer a slightly warmer side to ease aching muscles, while the other prefers it it be a little cooler. And a final benefit is that there is little to no movement when one couple moves while sleeping, or getting in and out of bed, as there is two separate mattresses divided by a non-intrusive piece of foam that clearly separates the two mattresses (optional). Although a little more expensive due to the second bladder and temperature controls, most of customers choose the duet system to ensure the perfect nights sleep. Yes, we stock mattresses for the older style timber frame waterbeds. We love the older style timber frame beds at Waterbed World. And we know our customers do too. These old beds were beautiful to behold and built to last, and we see so many today that have lasted and stood the test of time. Some of the beds we see today still have bladders from well over 15 years ago. Although it is a testament to their longevity, we also recommend that customers replace their bladders after about 10 years. We stock mattresses that will fit the older style timber waterbeds. 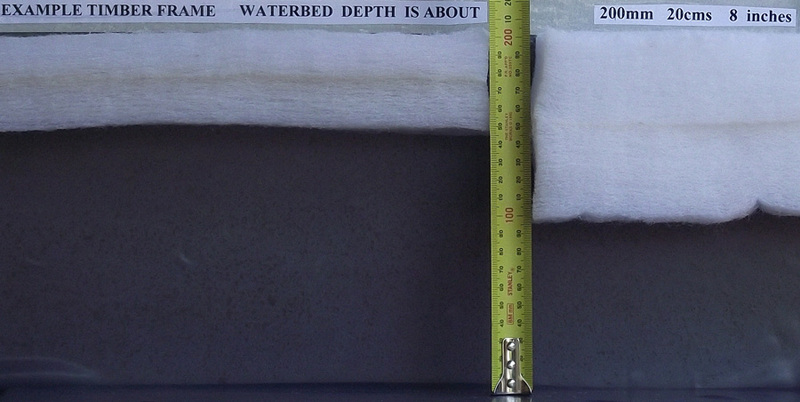 Just like in our softsider waterbeds, mattresses for the timber frames come in a range of comfort levels to suit you. We can also install a twin bladder system in the older style timer water bed for the ultimate in comfort for you AND your partner. It is also possible to put a softsider mattress inside an old timber frame bed without the need for too many modifications. If you are interested in doing this, come in and see our friendly staff. If converting to a softsider waterbed system, it would be great to know the exact dimensions of the current timber frame bed (height, width, depth and length) and perhaps a few photos if possible. We need photos if we are making an old timber frame bed a little higher to make it easier to get in and out of. Generally in the waterbed industry, these baffles are referred to as comfort levels. Many people will use the phrase 4 or 5 level / layer bed. The problem is, is that there is no industry standard as to how thick these baffle layers need to be. The weight of the materials used is the most important part of this equation. Some companies will use 4 layers of baffles, but the weight of the baffles may be only 300gsm. 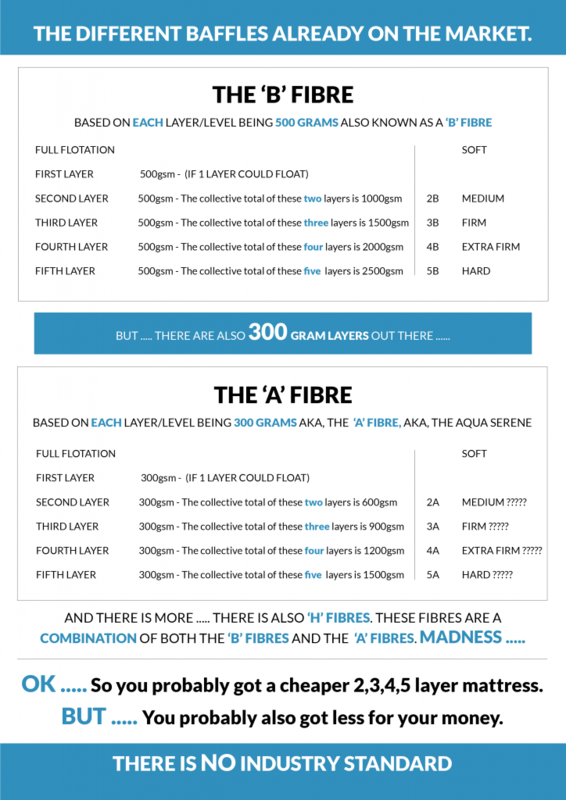 (4 x 300gsm = 1200 gsm) Others may use 3 layers of 400gsm fibres. (3 x 400gsm = 1200 gsm). As you can see here, the 3 and 4 layers both add to 1200gsm in total. Finding out what weight the actual baffle fibres are can be very tricky and impossible on some sites. 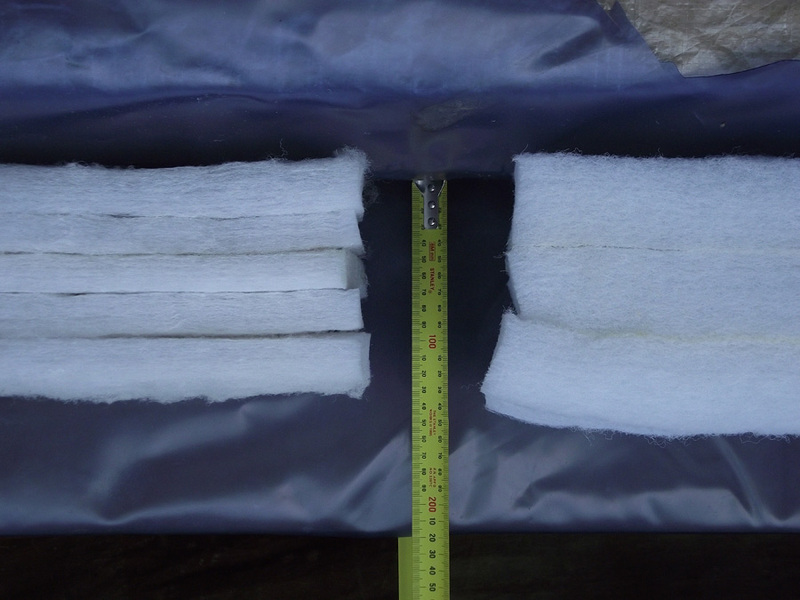 Our foundation baffle layers (right) are much thicker than our competitors (left). (The standard practice for the industry, is to use either 300gsm or 450gsm materials. The gsm refers to ‘grams per square metre’. (If a square metre of the baffle material was placed on a set of scales, the weight shown on the scales would be 300grams or 300gsm). At Dreamlover Waterbed World, we want to make baffles very simple and easy to understand for our customers. All our beds are measured by the weight of the fibres, not by the amount of layers. At Waterbed World, when we say 1500, 2000, 2500 or 4000 gsm, you can rest assured knowing that is the collective weight of the baffle fibres inside the mattress. The more baffles, then less movement. Easy. The best way to understand how baffles affect the waterbed is to come in to our showroom and lie on a few different beds. You will understand the differences and become an expert within minutes, The difference in feel between a bed with 2500gsm of baffles and a bed with only 1000gsm is immense. It is so very important to come and try all of the different beds to find the right one for you. Baffles are only good if they are floating. If you are getting a bit too much ‘rock and roll’ in you bed, chances are the baffles may have sunk and are not doing their job effectively. You can see if your baffles are floating by opening the valve. The baffles should be the very first thing you see. In days gone by, manufacturers used to call these differing comfort levels by using the term ‘Layers’. The old industry standard of calling these mattresses by layers is a little deceptive. The layers refer to how many layers of baffles are inside the mattress. One layer of baffles is called ‘1 Layer’, a ‘2 Layer’ mattress has 2 levels of baffles inside and so on. Unfortunately, there is no standardised measurement for how thick these baffles are in the first place. One company may use baffles that are 300gsm , while another may use baffles layers that are 465gsm. There can obviously be a vast difference between the firmness of a mattress from different manufacturers. Thats why it is always better to come in and compare, feel and contrast the differences for yourself. At Waterbed World, we do things a little different. No stuffing around. We make choosing your waterbed easy. 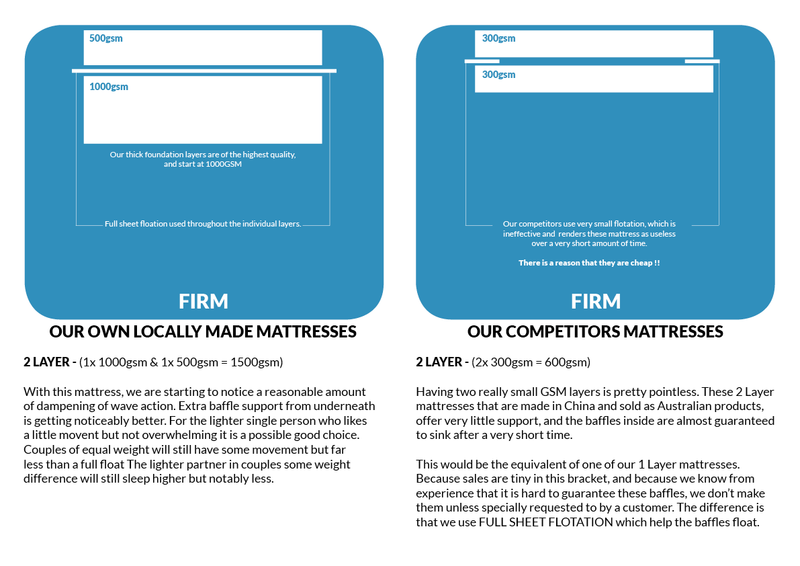 Here is an example of our ‘2 layer’ mattress (right) compared to our competitors (left). Our foundation layers are much thicker, with a much higher density. After 5 years, which baffles do you think will still have the performance that it should? The difference between different manufacturers can be very stark. Our bladders (right) are guaranteed to float after 5 years. 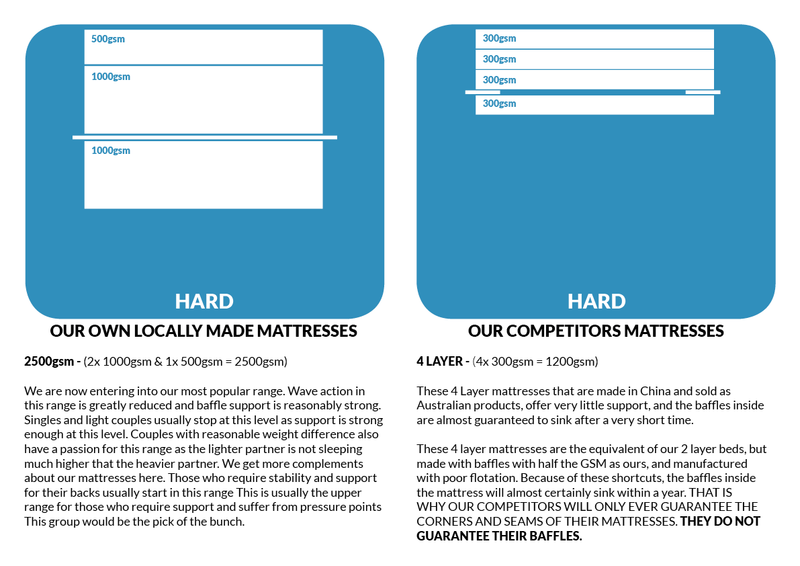 Here, you can see our ‘3 layer’ mattress (right) compared to our competitors. They need 5 layers to match our 3. Our 4 layer mattresses (right) offer genuine movement reduction and performance. Our 4 layer mattresses (right) offer genuine movement reduction and performance. This is the reason we make our own bladders. The ‘four layer’ from our competitor (left) will be effective for only a short amount of time. We have seen relatively new bladders ‘made’ (or perhaps imported) by other suppliers which offer NO baffling performance as they have sunk. 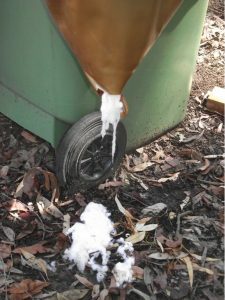 This can occur in as little as 3 months after purchase. We have seen it with our own eyes !! And quite frankly – it is not good enough. Do you think your current mattress performs the exact way as the day you bought it? If not, talk to us about your needs. 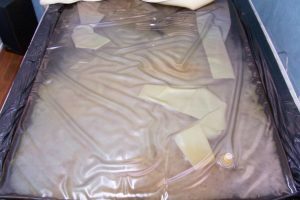 Why do people buy wave reducing waterbed bladders, also known as waveless? The very obvious answer to this question is to minimise movement in the bladder. But if the baffles inside the mattress do not float, then the mattress is not doing its job. So, if the cheaper bladders do not work, or only work for a very limited time, then it would make sense to buy a full float mattress instead !! 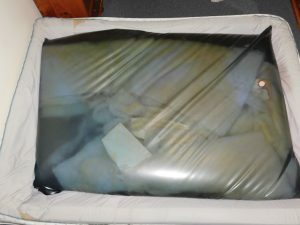 At Dreamlover Waterbeds, when it comes to our wave reducing waterbed bladders, we believe that it should be effective. Over the years we have seen FULLY IMPORTED WAVE REDUCING BLADDERS where the baffles inside do not float, rendering these bladders virtually useless. We refer to them as “5 LAYER FULL FLOATS” or “4 LAYER FULL FLOATS. So what do you do if you get a 5 layer full float mattress that doesn’t work? Do you have a comeback on what we deem to be faulty wave reducing bladders? There is a very good reason why we make our own mattresses. We have been very unimpressed by the recent flood of imported bladders that come from overseas. These mattresses already have the baffles inside, but are mainly very poor quality, have limited flotation built in and perform terribly. Especially over a short amount of time. At Dreamlover, we thought that this was a very poor outcome for our customers, and the waterbed industry in general. That is why we make our own mattresses with locally sourced baffle fibres. We use full sheet flotation between the baffle layers to ensure flotation over time. 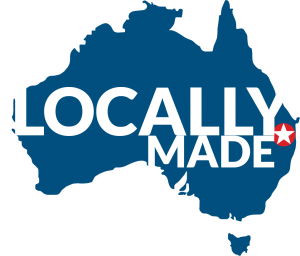 We also only use hospital grade baffle materials, which are 1000gsm to start with, and when these two parts are married together – the final product is the very best mattress available, and made locally in Brisbane. It is for this very reason that we can offer our famous 5 year warranty. Again, this warranty is for the corners and seams AND the baffles inside the mattress. WE GUARANTEE THAT OUR MATTRESSES WILL FLOAT AFTER 5 YEARS !! No other manufacturer in Australia offers this type of comprehensive warranty. THAT IS THE DREAMLOVER DIFFERENCE. There are many different variations when it comes to waterbed mattresses and finding optimal comfort can vary between each and every person. Some people love the feeling of floating entirely on water, while others prefer their beds to be much firmer. Finding the exact mattress for you can be a little daunting. If you are able to come into our showroom, you can try ALL the mattress comfort levels for yourself in order to find the perfect bed for you. 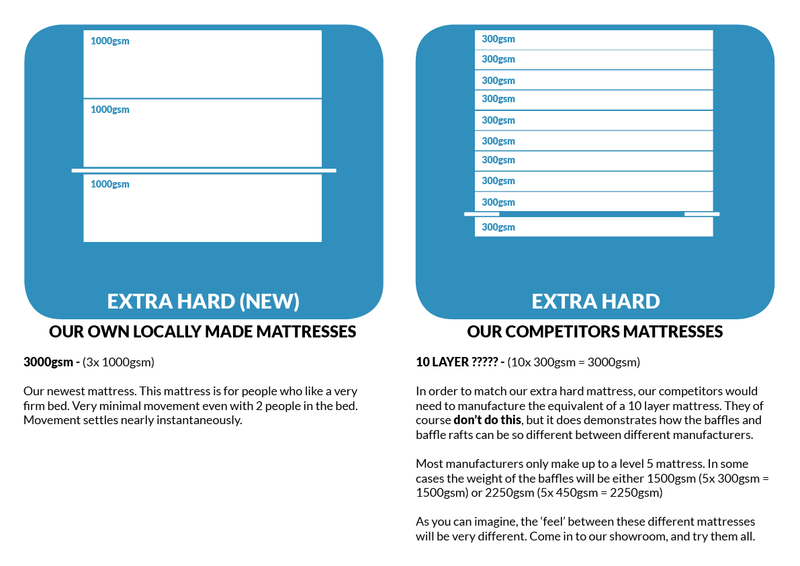 If you are unable to come into our showroom, we have a list of our mattress comfort levels below. 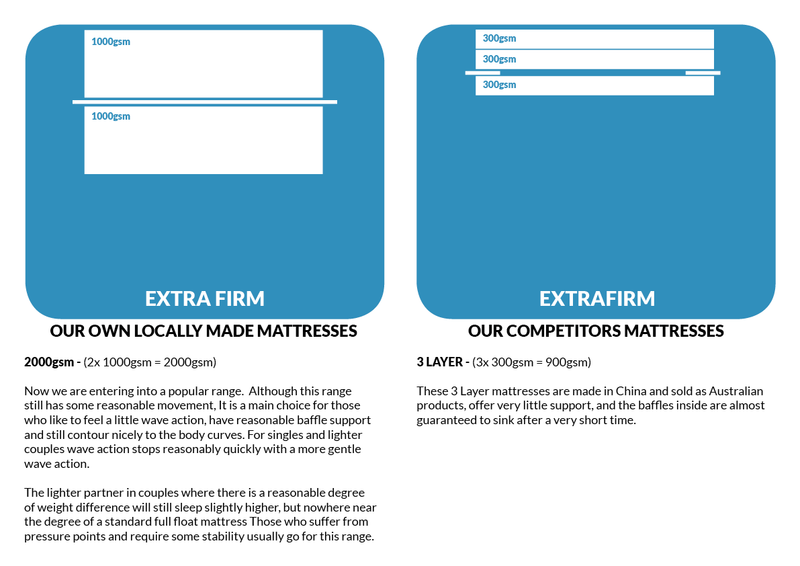 If you have any questions regarding any of these mattresses, then please contact us and we can walk you through it. MOVEMENT: This test is conducted when bed is filled to specifications. In our test there are no people on the bed or bedding items with the exception of the lambs wool cover. Please note that the zip on/off covers, which are standard with the softsider waterbeds and with the reduction of water volume, wave motion is reduced. It is hard to compare a softsider with a timber frame bed because of this. Our test is to sharply push down one corner of the mattress until you can’t go any further and then wait. Times are approximate. ‘Rock ’n’ Roll’. Also known as full-float. This mattress contains no internal baffling. It is referred to as a standard or full float bladder For one person the mattress will move around a lot and will settle down reasonably quickly. For two people of near equal weight, the movement of one will disturb the other for about five to seven seconds. There are still a few who adore this type of mattress where movement is not an issue. For two people of different weights, the lighter one will sleep higher than the heavier partner. This type of mattress will contour into different body shapes with equal support all around. If movement is not an issue then this bed should be ideal. For people with back pain and who suffer from pressure points where movement is not an issue, this is definitely one mattress you may want to test. Mattresses with a minor amount of baffles are nearly a waste of time and sales interest is reflected accordingly. The baffles will dampen movement only a small amount. There is very little baffle support with couples of different weights, and as a result, the lighter one will still sleep higher. Now we are starting to really notice a reasonable amount of dampening of wave action. Extra baffle support from underneath is getting better but still in the lower level. For the lighter single person, who likes a little movement but not a lot, this can still be a little overwhelming. For couples of equal weight, this will still have a lot of movement but far less than a full float. In couples with some weight difference, the lighter partner will still sleep higher but notably less than a full float mattress. ‘I like the feel of a waterbed, but don’t want to flop around a lot’. Now we are entering into a popular range. Although this range still has some degree of movement, it is the main choice for those who like to have some baffle support and still contour nicely to body curves. For singles and lighter couples wave action stops reasonably quickly with a more gentle wave action. The lighter partner in couples where there is a reasonable degree of weight difference will still sleep higher, but nowhere near the degree of a standard full float mattress. Those who suffer from pressure points and require some stability usually go for this range. ‘I don’t want to move around a lot, I need something firm for my back but don’t want it hard and I don’t want to sleep on top of a hill when my partner is in bed’. Being one stage up from the previous range there is more support and stability. Some lighter couples are starting to find this range hard. For those who require support and stability, they find this range perfect. This range notably starts another process called compression. The baffle thickness, now near the depth of the mattress, compresses when someone lays on it as the baffle now touches the top and bottom of the mattress skin. Most who test lay on this bed in our showroom, usually want to go a little less hard. ‘Now we are comparing these waterbeds to medium and extra firm innerspring supports’. Being one stage up from the previous range there is more support and stability. Some lighter couples are starting to find this range hard. For those who require support and stability, they find this range perfect. This range notably starts another process called compression. The baffle thickness, now near the depth of the mattress, compresses when someone lays on it as the baffle now touches the top and bottom of the mattress skin. Being one step up from the previous range, there is even more support and stability. For those who need a firm bed with little movement, this is the bed for you. This range starts another process called compression. The baffle thickness, now near the depth of the mattress, compresses when someone lays on it as the baffle now touches the top and bottom of the mattress skin. While we do not have this one in our showroom, people can try the Hard version, and if they feel they need something a little stronger, we can make this mattress to order. One thing for sure is that there are a lot of choices when it comes to finding your ideal mattress. Some like it hard, some like the ‘rock’n’roll’ feel of a full float. There really is only one sure fire way to find your ideal bed. And that is to come into our showroom and sample them all. If one person likes the free and easy feeling, while the other partner likes a firm bed, you can both be perfectly happy by choosing one of our duet systems, which have two separate bladders and two temperature controls so each person can sleep uncompromised.